Picked up this sample from Holt Renfrew last weekend. It's a very pretty scent! If you know anything about accounting you will notice a very silly mistake I made in the second line. Haha! That looks delicious! And I've heard great things about the scent. the first cream made me think of creme brulee and now i'm seriously craving. hmmm, not good. I also get a lot of pleasure about finishing off a pot of creme! You've been working hard-glad you've got some little indulgences along the way to ease all that accounting! your food looks delicious !! good luck studying girl, cute post. I get excited when finishing off any product too! You know a new one is around the corner! ps - I love your nail polish in your first photo! As I know NOTHING about accounting you're absolutely safe with me... I'm just mighty impressed. 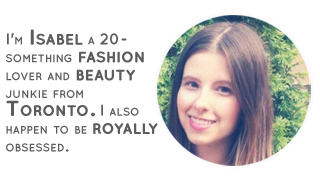 Girl of the Blogosphere: Ellen H.